As we prepare to celebrate Thanksgiving and remember all the things we have to be truly grateful for this holiday season, I thought it would be appropriate to share a handful of Thanksgiving-related Disney stories. Today, Christmas decorations and sales start even before Halloween, with Thanksgiving often forgotten—even though once upon a time it was one of the most important and memorable holidays. While Disney made a few cartoons themed to Christmas and one to Easter, the studio never made an animated cartoon that featured Thanksgiving. First, there was the fear that doing so might limit its distribution since many other countries did not celebrate the distinctly American holiday nor understand the traditions. Second, there was also the fear that theaters would only re-release the cartoon during that short period between Halloween and Thanksgiving, severely limiting the amount of revenue it might generate. However, during 1938, the Disney studio did some preliminary work on a Thanksgiving Mickey Mouse short to be titled Pilgrim Mickey. The film would have opened with Mickey inside a log cabin wrestling with what seems to be an Indian chief with an elaborate headdress. Actually, as the camera starts to move closer it is just Mickey struggling with a feather duster as he is telling his nephews a harrowing tale of trying to get a turkey for Thanksgiving. During a hunting expedition, Mickey mistakes an Indian war bonnet for the tail feathers of a turkey he was hoping to get for Thanksgiving dinner. He sees the feathers above a fallen log and when he yanks it up he pulls the headdress off a startled Indian brave and is taken captive by the tribe. He is rescued by his nephews before he suffers dire consequences. On April 4, 1939, the cartoon was put on hiatus, but with the statement that it would be resumed later. It never was. Actually, many Mickey Mouse cartoons during this time were started and then cancelled for a variety of reasons, but primarily because the story wasn't strong enough or there weren't enough good gags. Decades later, Mickey did appear in a Thanksgiving themed short: The Turkey Catchers, where Mickey, Donald and Goofy are hired by a pompous pilgrim to hunt for a turkey for Thanksgiving dinner. The short first appeared in 1999 as an episode on the television show Mickey's Mouse Works and then appeared later as part of House of Mouse's House of Turkey episode in 2002 where the guests try to capture and eat the turkey who does a performance of the song Turkey in the Straw. Of course, today Disney has sold everything from a Thanksgiving themed Pilgrim's hat with mouse ears to Mickey and Minnie salt and pepper shakers in Pilgrim garb, so Mickey is well represented during the holiday. Thanksgiving weekend November 1971 was a historic moment at Walt Disney World, demonstrating beyond a doubt that the new vacation kingdom was a success. The media had dubbed the October opening of the Magic Kingdom as disappointing in terms of the actual number of guests that showed up. The Disney Company had purposely chosen the slowest day of the week and the slowest month of the year for tourist traffic to give the new theme park some time to make necessary adjustments before the holiday season. "Turkey day brought a crunch of first-time visitors jamming roads in every direction. Eager fans were camped out along the Florida Turnpike and 1-75 all the way to the Georgia border, about two hundred miles away." Thanksgiving Thursday was dubbed "The Traffic Jam Heard 'Round the World." The Magic Kingdom quickly reached a capacity of roughly 50,000 guests early in the day with more than 5,000 cars being turned away from the parking lot. The traffic congestion on Interstate 4 leading into Walt Disney World was backed up for more than 20 miles. One news report declared it "the longest parking lot in the world." "It seemed everybody in the country had suddenly decided to go to Walt Disney World that day. The Kingdom was taken completely by surprise," wrote Edward Prizer, publisher of Orlando Magazine. "Radio stations frantically broadcast reports of a bumper-to-bumper jam on I-4. For the first time, Disney was forced to close the parking lots. Thousands of tourists had to cool their heels in motel rooms until the stampede subsided." "Within an hour we were meeting and talking over the problem," remembered Disney executive Bob Allen. Bill "Sully" Sullivan told me, "We opened purposely when we did because it was not a peak period for Florida. We said let's wait until Thanksgiving and if we have problems at Thanksgiving – if we don't have the attendance - then we've got a problem. "On Thanksgiving, we backed up traffic 11 miles on I-4 and all the way off the property," he said. "Backed it up all the way to the rest area. It was a hit and it was just gangbusters from there." "Everybody really had to turn and help each other." added Bob Matheison who became vice president of Parks. "Whether it was parking cars, traffic control in the parking lot, or cooking hot dogs, it took everybody's contribution, not just the people assigned to the operational aspects. We heard about [the big traffic jam] from places like India, five years later!" Both the Disneyland and Walt Disney World petting zoos have been homes for presidential pardoned Thanksgiving turkeys. The first officially pardoned Thanksgiving turkey was in 1989 on the first Thanksgiving in office of President George H.W. Bush, although informally some other Thanksgiving and Christmas turkeys had been given stays of execution by earlier chief executives. However, they were not considered an official pardon. At some point, the birds who escaped a White House dinner were sent off to petting zoos and, beginning in 2005, they were sent to the Big Thunder Ranch at Disneyland. The first pardoned turkey (who like other turkeys were pardoned because they had not committed a crime) to be sent to Walt Disney World was in 2007. On November 20, 2007, in a ceremony at the White House Rose Garden, President George W. Bush pardoned both turkeys May and his backup Flower (Mayflower, get it?) and said they would be "flown to Disney World, where they will serve as honorary grand marshals for the Thanksgiving Day Parade. May they live the rest of their lives in blissful gobbling." Both birds got a first-class flight to Orlando on a United Airlines jet and a red-carpet entry to WDW. WDW spokesperson Duncan Wardle said that this tied in with Disney's "What's next? I'm going to Walt Disney World/Disneyland" advertising campaign featuring a star football player after each Super Bowl. Each year, the National Turkey Federation works with different farmers to send two birds to the White House. One will be pardoned, and the other is a backup. Neither is ever really at risk of winding up on the First Family's dinner table. "Everyone calls it 'the pardon,' but it's the presentation of the national Thanksgiving turkey," he said. "I believe it was George H. W. Bush who made an offhand comment that he was going to pardon the turkey, and that's where it became a custom." After a while, Disney no longer wanted the turkeys nor the responsibility associated with them. Beginning 2010, the pardoned turkeys were sent to George Washington's Mount Vernon estate and starting in 2013 they have been sent to Turkey Hill Farm in Morven Park in Virginia. Macy's Thanksgiving Day Parade is considered the official opening of the Christmas shopping season. The famous balloons were originally the designs of Tony Sarg who also did the display windows for the New York store. In 1934, Sarg teamed with Walt Disney to produce the first Disney balloons to appear in the Macy Parade. The star on the chest of the characters was a nod to Macy's logo. The advertisement for the November 29, 1934, parade proclaimed "See Gigantic Balloons designed by none other than Walt Disney creator of Mickey Mouse Himself. Mammoth Mickey Mouse a Colossus 40 feet high!!!! Pluto the Pup!! The Happy howling canine. Horace Horsecollar filled with fun and helium. 12 ½ feet high. The Big Bad Wolf!!! Held down by thirty marchers!!!!! See the Big Bad Wolf 34 feet high. See the Pig 31 feet high!!!" Mickey Mouse was advertised as being a "colossus 40 feet high" in the 1934 parade. That pig balloon was a very bad version of the overall wearing pig from the popular cartoon Three Little Pigs (1933). The press laughed at the portly pig's difficulty at getting under the elevated train line at 65th Street and again awkwardly maneuvering at 53rd Street. Canvas was quickly placed on the street to protect it from the rough, rain-soaked pavement. He was slowly glided under the structures on his back to successfully rise again and finish his parade trek. Following the pig was the Big Bad Wolf with a white star on its chest. Why was Horace Horsecollar only 12 1/2 feet high? Because a team of six Horaces pulled Santa's sleigh instead of reindeer as the last float in the parade! Also in the parade, a costumed Peg Leg Pete was in a cage and he strained at his bars, occasionally escaping and running toward the spectators but then being forced back into his jail cell. It was estimated that more than 500,000 people showed up for the twenty-five minute parade even though there was a rain drizzle. Roughly 2,000 policemen supervised the event. The star balloon debuting in 1935 was Donald Duck. Returning was Mickey, Horace, the Big Bad Wolf and Pluto. More than a dozen balloon handlers, who were dressed in black sweaters, baggy shorts, black tights and Mickey Mouse masks, held on to ropes and guided the helium-filled mouse down the street. Mickey's face had been painted in Akron but the rest of his body was painted in a huge warehouse in New York. 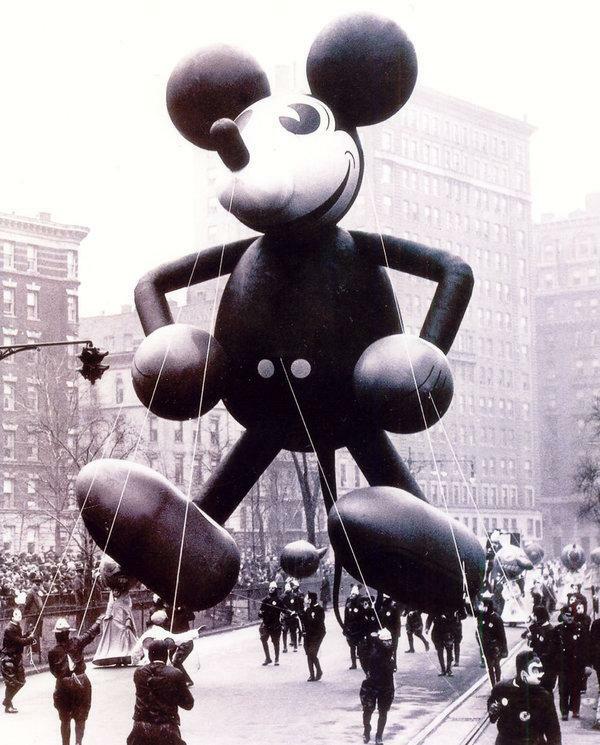 Thanksgiving Day 1938 the Mickey balloon was part of the Santas on Parade sponsored by the Jordan Marsh department store in Boston. After 1939, Mickey Mouse as a balloon disappeared from the Macy's parade for several decades, until 1970, when an updated Mickey appeared just in time to help promote the upcoming opening of Walt Disney World. This was a colorful, more modern Mickey wearing an opened collared, short sleeved yellow shirt, his famous red shorts, yellow shoes and white gloves and pupils that were so close together that Mickey looked cross-eyed. In 1971, gale-force winds grounded all the Macy balloons and television viewers had to settle for watching clips of the balloons from the 1970 parade. Mickey was back flying high in 1972. The 1973 parade celebrated the 50th anniversary of Walt Disney cartoons (since the Alice Comedies premiered in 1923) with the Mickey Mouse balloon and costumed Mickey, Pluto, Goofy and Pinocchio near the Disney Circus wagon float. Other Disney floats were devoted to Alice in Wonderland and Captain Hook's ship, as well as the Walt Disney World Castle showcasing that year's animated release, Robin Hood. Manfred Bass, who was the designer of the parade for forty-one years beginning in 1960, remembered about the castle float: "That was really a lot of fun, working with the Disney people. They wanted us to reproduce the castle and celebrate it in the parade. We were in a sweat about the whole thing, but it was an exciting project." After being given some general information and "a little thin sketch," Bass and his crew began to develop the castle float design not only from a creative perspective, but also for its technical needs. "Our goal was to make the castle look as big and grand as possible," he said. "And yet, all parade units have to be transported from Hoboken, New Jersey, into Manhattan on the night before the parade. That means no unit can be more than 12 1/2-feet high or 8-feet wide in order to fit through the Lincoln Tunnel under the Hudson River. So how do you capture the majesty of the actual Disney World Castle given these physical restrictions? You have to create a 'magical box'!" So various parts of the castle float were designed to fold up, fold down or telescope into position. The sides of the castle were folded out, and various elements were put in place, including the three telescoping turrets. In 1984, Donald Duck marked his 50th birthday by once again appearing in the parade with a new balloon. Goofy took the spotlight in 1992, appearing as Santa Goofy which was the "new" balloon in the year's parade. That procession also featured 6,000 amateur tap dancers donning Mickey Ears, tapping to set the Guinness World Record for Largest Assembly of Tap Dancers. Mickey Mouse again disappeared from the parade for a period of time but was re-invented for the 74th Macy's Thanksgiving Day Parade in 2000, as Bandleader Mickey Mouse led the parade into the new millennium. The red and gold outfit was inspired by Mickey's bandleader outfit from the 1950s Mickey Mouse Club television show (although the balloon Mickey's baton in his right hand was significantly different). 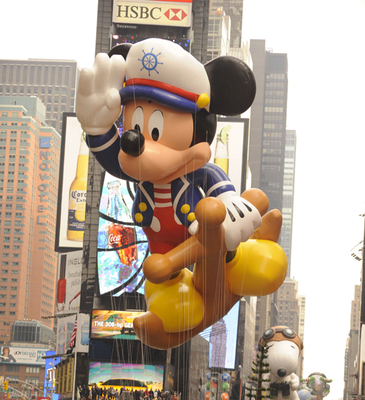 A special Sailor Mickey Balloon, about six-stories tall, made its maiden voyage in the 83rd Macy's Thanksgiving Day Parade in November 2009 and continued to appear through 2011. It represented the Disney Cruise Line, which had announced the launching of two new ships: the Disney Dream and the Disney Fantasy. Mickey, perched upon an anchor, added to his iconic red shorts, white gloves and yellow shoes, a sailor's cap and a nautical blazer. The Sailor Mickey balloon was approximately 61 feet high, 33 feet wide and 48 feet long. It took about 14,000 cubic feet of helium to fill the Sailor Mickey balloon and it was guided by a team of 70 volunteers. Sailor Mickey was was first seen in 2009 tied to the launch of two new Disney Cruise Line ships. He didn't want a stuffy-looking captain, so he reviewed early Mickey Mouse shorts and was taken by Boat Builders (1938) and based Mickey's outfit on that cartoon. He went through a variety of designs from Mickey tied to an anchor to a life preserver around the mouse's midsection. None of those concepts seemed like a good idea for a cruise ship emphasizing safety. So, it was determined that Mickey would be saluting and riding on an anchor as if it were just lifted from the water for the ship to set sail. Like too many other Walt Disney World cast members in March 2009, Ebersol was surprised to find himself laid off from the Disney Company. The responsibility of finishing the Sailor Mickey project fell on the shoulders of another very talented Disney Design Group artist, Brian Blackmore, who had to go to New York to approve the clay sculpture for character integrity and, later, color approval. Despite all the hoopla about Mickey's 90th anniversary, Mickey will not appear in this year's Macy's parade, but a balloon of Olaf from the Disney animated feature Frozen will. One of the iconic food treats at Walt Disney World is the infamous, enormous Turkey Legs that made their debut in Frontierland in the late 1980s. Originally, they were sold at only one food cart location, but the demand grew so large that they expanded to other Disney parks including Disneyland. Weighing roughly one and half pounds each, the legs have a taste that vaguely resembles ham thanks to being cured in a similar salt and sugar solution. The legs cost up to twelve dollars each. Each leg is roughly 730-1,136 calories with a minimum of 36-54 grams of fat, according to the size of the leg. Originally, Disney sold legs that were 22 ounces but today the "jumbo" leg is closer to 34 ounces. A persistent urban myth was that the legs were so huge that they couldn't possibly be from an actual turkey and must be from another bird like an emu or an ostrich. "People are accustomed to Thanksgiving turkeys, which are female birds, or hens which are traditionally much smaller; the males, called toms, are bigger — up to fifty pounds apiece — and their legs are the ones that Disney serves," said Keith M. Williams, a vice president at the National Turkey Federation, an industry trade group. "Many guests aren't familiar with smoked poultry, so they pick up on the salty flavor. Disney injects their legs with a salt water cure for moisture, then smoke them. Turkey legs have pink meat because of the six-hour smoking process. It flavors the legs and keeps the inside meat pink and moist." The food treat became so popular that in 2010, Disney created a line of merchandise souvenirs including hats, pins, magnets, t-shirts and even air fresheners featuring an image of the item and the slogan "Nice & Juicy!" Disney bakeries even produce Rice Krispie Treat versions with chocolate icing as the skin starting in 2011. Turkey legs were no longer available at Disney's Animal Kingdom Park as of March 1, 2016. Disney has stated that the legs are meant to be shared and that the average park visitor walks about seven miles during a visit or enough to burn most of the calories from eating the leg. They state that the popularity of the food item is due to its novelty and its "comfort food" factor.